To Cottesbrooke Hall this very cold morning (slightly late due to my forgetting that there are ghastly roadworks on the A43) to go over progress. 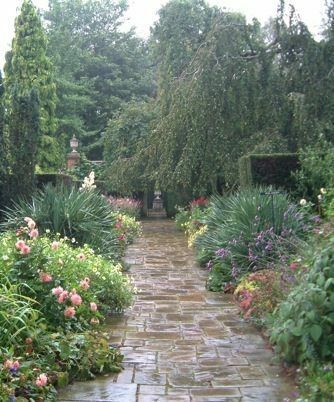 It is a wonderful house and a great garden upon which I have been working for a couple of years. I began by analysing the whole way that the gardens were operated and suggesting changes – sounds a bit managementy for a gardener but I have done it with a couple of large gardens and it is quite fun – snootling around seeing what is efficient and what isn’t : things like that. 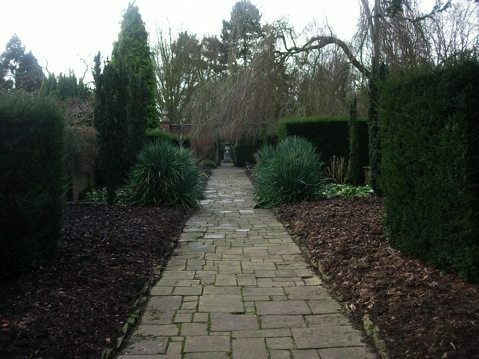 Anyway, the current task is replanting the centrepiece of the garden which consists of two long and venerable borders. We decided that the time had come to tear them up, split and divide the plants and then put them all back together in a slightly different style. The gardens have, historically, relied a lot on bedding (in particular some really good dahlias) and we decided to put in more herbaceous – mainly in order to save time and money. The picture on the right was taken a couple of years ago in the late summer (and just after a rainstorm, hence the very lovely gleaming York stone paving). There are a lot of tulip bulbs planted through the borders but it seems depressingly likely that the whole lot are suffering from blight and those few that get to poke their heads up will be misshapen and blotchy. I adore tulips – possibly more than any other flower but, like most very beautiful people, they can be most awfully troublesome when they put their minds to it. I also made the (slightly contentious) decision to rip out the Yuccas. They have been there for ages but look very scruffy and the gardeners have to spend a silly amount of time snipping off the pointy ends of the leaves to stop visitors’ laddering their tights or children losing eyes. The gardens are open every week through the summer (details at www.cottesbrookehall.co.uk), it is well worth seeing. The gardens have been quite static over the past decade but are now beginning to move again – the very clever Arne Maynard is also doing work there. I am listening to The Last American Man of Action by Sounds of the Czars. The photograph is of the view towards Brixworth from Cottesbrooke. Stealthily, Leonora edged towards the mushroom.